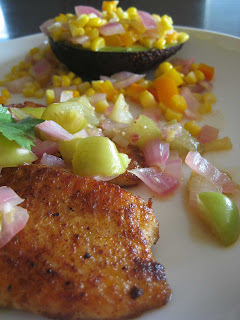 Words cannot describe how much I love Rachael Ray's Tilapia with Tomatillos and Avocado filled with Maque Choux recipe. When pressed, this is what I cite as my favorite of all her recipes and I make it pretty often. Now that's really saying something, since I hardly ever make the same thing twice! This is also one of the first recipes I made that was really out of the box for me. It's from 30 Minute Meals 2, which is the first Rachael Ray cookbook I bought. Tilapia is a good "starter fish" if you aren't used to cooking fish at home. It's pretty resilient bit also picks up a whole bunch of flavor. And just a warning - this recipe is a little bit spicy. Now, the avocado thing is really so outstanding that you gotta try it. If you told me I'd like something like this, I would have laughed in your face a few years ago, but now I could eat an entire meal of avocado with maque choux! The story behind this recipe is one that Rachael tells pretty often. The first night she met John, he said he liked to cook and she thought it was just a line. So, she asked him what he made for dinner the night before and it was a variation of this recipe. So, enjoy and don't get mad at me when you become addicted to it! Season fish with salt, pepper, cumin, paprika. Heat a nonstick skillet over medium high heat. Add 1 tablespoon oil, 1 turn of the pan. Heat an ovenproof serving plate in a warm oven. Saute fish 3 minutes on each side or until opaque. Squeeze the juice of 1/2 lime over the fish and carefully slide the fillets onto warm platter. Cover the fish to keep it warm. Return pan to heat and add remaining tablespoon of oil, 1 turn of the pan. Over medium high heat, quickly saute the red onion, jalapeno and the garlic. Saute a minute or so, add the diced tomatillos with seeds and juices. Season mixture with coarse salt and saute the mixture of vegetables 5 minutes. Once you get your sauce working, get a second skillet hot over moderate heat for your maque choux. Add 1 tablespoon extra-virgin olive oil (1 turn of the pan,) chopped onion, jalapeno and red bell pepper. Saute 2 or 3 minutes. Working on a plate to catch the milky juices, scrape corn off the cob. Break up the kernels and pour into the skillet. Combine corn with peppers and onions. Season with a sprinkle of sugar, a dash of cayenne pepper and salt. When mixture bubbles, reduce heat to simmer. Cut butter into pieces and stir into corn mixture. Allow mixture to simmer and cook until creamy, 5 to 7 minutes. While corn is working, go back to your sauce for the fish. Add the beer and the juice of 1/2 lime and cilantro to the pan. Simmer sauce 5 minutes longer, then spoon hot sauce down over the fish filets. Garnish platter with a few extra sprigs of the cilantro. Cut avocados in 1/2 lengthwise and remove pits. Squeeze lime juice over the avocados to keep them from browning and season them with a little coarse salt. Arrange on the serving plate. I recently made a tomatillo sauce for the first time from Ellie Kreger. With chicken. It was amazing. I'll have to try the Tilapia. Sounds & looks fantastic!